Matches and Stars announced for May 21 Live Event! VIP Ticket holders enter at 5 PM for a FREE BBQ with special showcase show. Lots of food and fun! To purchase by credit card, CLICK HERE. The line-up for the big live event on May 21, 2016 is coming together! Be sure to buy your tickets today HERE! May 21, 2016 Tickets Now Available!!! Tickets are now available for online purchase for our May 21, 2016 Summer BBQ Event! 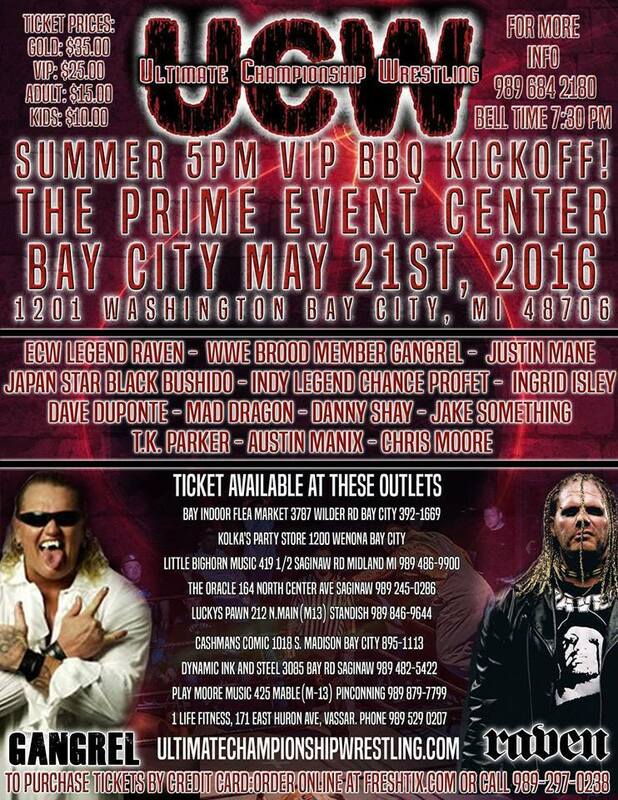 BAY CITY, Mich. – Wrestling fans, be sure to mark your calendars! Ultimate Championship Wrestling has announced the upcoming event dates through November. The following events will be live from the Prime Event Center in beautiful Bay City, Michigan. Saturday, September 24 belltime 7:30 p.m.
Friday, November 25 belltime 7:30 p.m.
For the latest information on Ultimate Championship Wrestling, be sure to visit www.ultimatechampionshipwrestling.com.